Pain is the most frequent complaint following burn injury and the pain associated with a superficial burn can be particularly severe. Unlike other types of pain, burn pain may worsen unpredictably during the course of healing. This occurs due to changes in the evolving wound bed like the appearance of epithelial buds which indicate wound closure is imminent. The burn itself creates mechanical and thermal hyperalgesia in human skin, but the pain from the mechanical stimulation of the wound during assessment, cleansing and debriding is another major source of pain which can continue after the procedure is complete. This is called procedural pain. It is often described as having an intense burning or stinging sensation. If the dressing is expected to be painful, short acting analgesics administered 45 minutes prior to wound bed manipulation will ease the procedure for both the patient and the nurse. Superficial burn injuries can cause significant background pain as well. Background pain can be described as a continuous burning and/or throbbing sensation which is present at rest and is relatively constant. The severity of background pain varies between individuals. It is best treated with regular slow release analgesics to keep plasma drug concentrations steady. Some patients may require short term admission for pain management reasons. The following table provides a recommended short term (<72 hours) oral analgesia guidelines for the management of superficial burn injury. Aim for pain scores of 4 or less at rest. 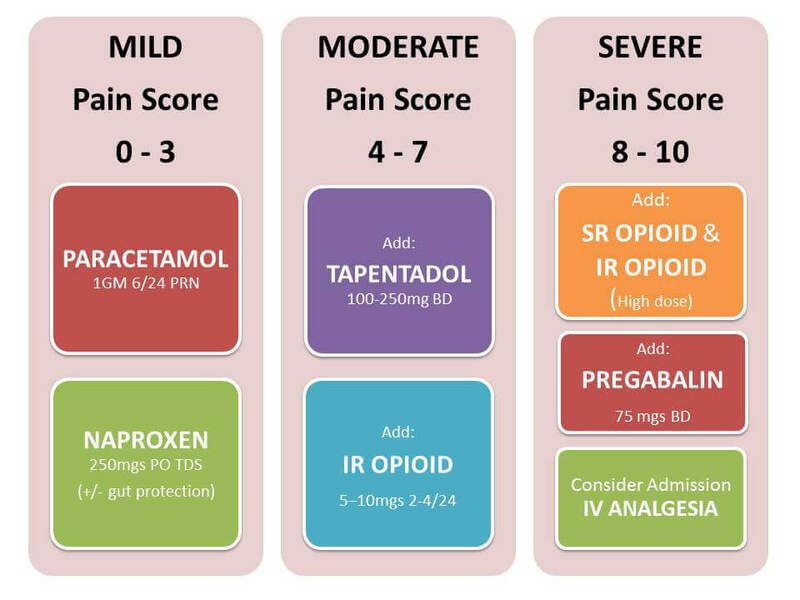 Analgesia should be reviewed after 72 hours and adjusted according to pain scores. Patient management should be guided by individual case and clinical judgement. Maximum 2mL (0.5mL for infants below 1500 grams) administered orally for each procedure. Two minutes prior to a painful procedure, administer a small amount (around 0.25ml) of sucrose onto the infant’s tongue. Offer a dummy if this is part of the infants care. Continue giving remainder of sucrose slowly during the procedure for a total dose of 2ml, until the procedure is completed. Stock bottles of 33% sucrose are available from Royal Children’s Hospital Pharmacy Department. Sucrose is only effective if given orally. There is no effect if given via an oral or nasogastric tube. Other strategies which assist in calming infants and can be used as an adjunct include; feeding (if allowed), cuddling, and wrapping.